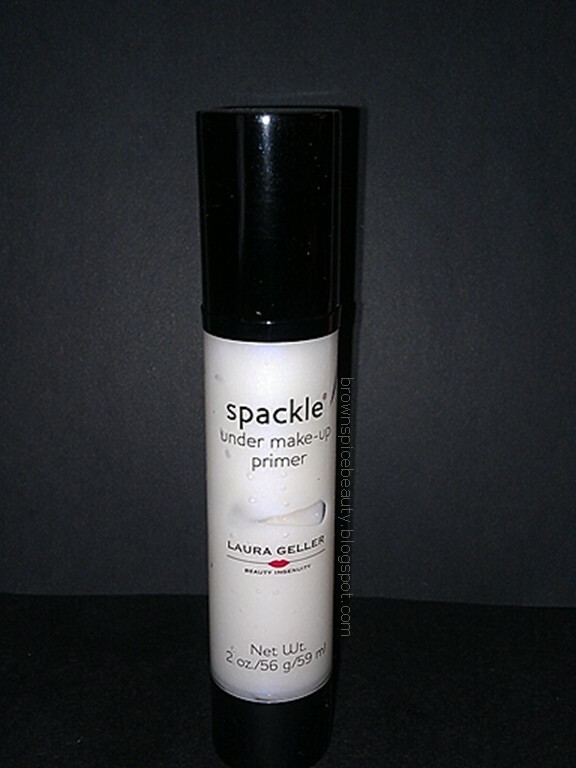 BrownSpiceBeauty: Laura Geller Original Spackle Make-up Primer Review! Laura Geller Original Spackle Make-up Primer Review! I have been watching Laura Geller on QVC for years and customers have always had great things to say about her Original Spackle Under Make-up Primer. I have never used a full face primer so, when one of my favorite shopping sites Hautelook.com had a Laura Geller sale event, I decided to scoop it up and give it a try. The Original Spackle Under Make-up Primer 2oz. retails for $27.00, but I scooped it up on Hautelook.com for only $15.00. The product description boasts that Spackle is made with natural plant extracts and the powerful anti-oxidants, White Tea and Centella Asiatica Extracts. These ingredients protect the skin along with Aloe Vera Gel. Spackle also helps the skin retain moisture, feel softer and look smoother. It is lush, incredibly lightweight and suitable for all skin types. The primer formula is clear and will definitely work on all skin tones. It does not really have a scent to it at all, which I love. The light scent it does have is very fresh. After applying it to my skin for the first time I noticed an immediate difference. My skin was much smoother. I also have very large pores on my nose that virtually seemed to disappear. My nose had a much smoother appearance. This has always been a challenge for me because makeup just seems to sit into the pores and define them even more. I was very impressed. The biggest difference was how my foundation just seemed to glide on. I used a foundation brush and found it was easier to apply and I was able to use much less foundation to get full coverage. This is a big PLUS! Consistency: Very lightweight and has a silky finish. Virtually no scent. Moisture Retention: It does lock in moisture. My skin looked more hydrated after application and it lasted under my makeup all day. Suitable For All Skin Tones/Types: Absolutely! The clear formula and use of natural plant extracts supports this. If you own this product or decide to try it, make sure you post a comment and let us know what you think.